Jacob Collier is an English singer, arranger, composer, producer, and multi-instrumentalist based in London, England. In 2012, his homemade split-screen video covers of popular songs, such as Stevie Wonder's "Don't You Worry 'bout a Thing", began to go viral on YouTube. Collier's style fuses elements of jazz, a cappella, groove, folk, electronic music, classical music, gospel, soul and improvisation, and often features extreme use of reharmonisation. In 2014, Collier signed to Quincy Jones' management company and began working on his one-man, audio-visual live performance vehicle, designed and built at MIT in Boston. On 1 July 2016, Collier released his debut album, In My Room, which was entirely self-recorded, arranged, performed and produced in his home in London. In February 2017, Collier was awarded two Grammys for his arrangements of "Flintstones" and "You And I", both from the album. Collier grew up in North London with his mother and two younger sisters. He attended Mill Hill County High School in North London, and The Purcell School for Young Musicians in Bushey, Hertfordshire. His mother, Susan Collier, is a music teacher, violinist, and conductor at the Royal Academy of Music in London. Collier's maternal grandfather, Derek Collier, was a violinist who also taught at the Royal Academy of Music and performed with orchestras around the world. Regarding the role music plays within his family, Collier says, "We sing Bach chorales together as family – it's just so much fun." Collier is partly of Chinese descent, through his maternal grandmother, Lila Wong. Collier was also a child actor in film under the name Jacob Moriarty. In 2004 he portrayed Tiny Tim in Arthur Allan Seidelman's A Christmas Carol. At the same time, Collier was also performing as a treble singer in classical roles such as one of the three boys in Mozart's The Magic Flute and "Miles" in Benjamin Britten's The Turn of the Screw, the latter of which heavily influenced his usage and understanding of harmony. Of Britten's harmonic language, Collier says, "my mind was shattered outwards." Collier received the ABRSM Gold Medal for the highest mark in the country for his grade eight singing result in 2008. Collier is a self-declared autodidact. He began uploading homemade, multi-instrumental content to YouTube in 2011, releasing, among others, vocal arrangements of Stevie Wonder's "Isn't She Lovely", "Pure Imagination", from the 1971 film Willy Wonka and the Chocolate Factory, and in 2013, a multi-instrumental rendition of Stevie Wonder's "Don't You Worry 'bout a Thing". His activity caught the attention of Quincy Jones, who flew Collier out to the Montreux Jazz Festival where he met with him and Herbie Hancock. Around this time, Ben Bloomberg, a PhD student at the MIT Media Lab, reached out to Collier regarding the creation and development of musical hardware and software for live performance. Over the following months, he and Collier developed and constructed a new multimedia live experience. In 2015, Collier's debut live solo show was completed and began touring Europe and the US. The performance featured a circle of musical instruments, with six simultaneous looping stations capable of simultaneous playback, backed by synced real-time 3D-captured video loops, projected onto a screen behind the instruments, courtesy of Louis Mustill and William Young of Artists and Engineers. Central to the One-Man Show was a custom-built vocal "Harmonizer" instrument which Collier designed and created with Bloomberg, which enabled Collier to perform multi-voice harmonies in real-time. The debut performance of this show was held at Ronnie Scott's Jazz Club in London. A few weeks later, Collier opened for Herbie Hancock and Chick Corea with the One-Man-Show at the 2015 Montreux Jazz Festival. In July 2015, Beats by Dr. Dre reached out to Collier to provide the music for 'The Game Starts Here' England Rugby World Cup campaign. Collier recorded an a cappella version of the well-known hymn "Jerusalem" for the commercial, which was aired on national television before each England match. In late 2015, Collier began working on his debut album In My Room, after performing with WDR Big Band in a concert in Cologne, Germany. He arranged, recorded and produced the album entirely on his own, playing every instrument, in addition to writing eight of the eleven songs. The album was recorded and mixed in one three-month period in the music room of his family home in London, England, hence the title. It was mastered by Bernie Grundman, and released on 1 July 2016 through the independent record label Membran Entertainment Group. Following the release, Collier embarked on a world tour with his one-man show including the 2016 Montreux Jazz Festival. In anticipation of the release of In My Room, Collier launched the "#IHarmU" campaign through Patreon, a crowdfunding site for content creators, where $100 patrons sent him 15-second video clips of melodies, which he harmonized with multiple vocal parts with his well-known multi-screen layout, and uploaded to his social media platforms. He demonstrated this creative process in a two-hour live-stream on 31 October 2017. [better source needed] Collier received more than 130 melodies and donations to the project, including from British jazz artist Jamie Cullum, Ben Folds, Herbie Hancock, and Kevin Olusola of the a cappella group Pentatonix, the latter for whom he arranged "White Christmas" on A Pentatonix Christmas, which won a Contemporary A Cappella Society award. In February 2016, Collier was featured on Snarky Puppy's album, Family Dinner- Volume 2. Then, on 22 August, Collier took part in a Quincy Jones tribute concert at the BBC Proms in the Royal Albert Hall in London, in which he performed his own orchestral arrangement of his original song, 'In The Real Early Morning', with the Metropole Orkest, under the baton of Jules Buckley, amongst other songs. In December 2016, Collier collaborated with 150 students at MIT to produce a 10 December live concert in Kresge Auditorium titled "Imagination Off the Charts", playing alongside orchestral arrangements of his repertoire. This residency was the subject of a documentary film, Imagination Off The Charts, which won a regional Emmy in June 2018. In February 2017, Collier won two Grammy Awards: Best Arrangement, Instrumental or A Cappella for the Stevie Wonder song "You and I" and Best Arrangement, Instrumental and Vocals for a cover of "Flintstones", the theme song from the 1960s television series The Flintstones. One month later he made his US television debut on The Tavis Smiley Show performing a rendition of 'You And I' with jazz-gospel a cappella group Take 6. In 2017, Collier also recomposed Samsung's signature ringtone, "Over The Horizon", for the new Samsung Galaxy S8/S8+, and was co-producer on two songs from Becca Stevens album, Regina. Collier also helped score DreamWorks’ 2017 film, The Boss Baby, with composer Hans Zimmer. The following month, Collier performed with Hans Zimmer and Pharrell Williams at Coachella Valley Music and Arts Festival. In April, Collier was also a guest on the daily weekday talk show Harry, and a speaker at the annual TED conference in Vancouver, Canada. Collier toured internationally with his One-Man-Show for two and a half years (between 1 July 2015 and 18 December 2017), alongside hosting masterclasses, and performances with orchestras and big bands around the world, including the Metropole Orkest. On 9 July, he and Cory Henry performed again with Metropole Orkest and Jules Buckley at North Sea Jazz Festival. In December 2017, Collier collaborated with American Pop/R&B singer Tori Kelly to record an a cappella YouTube video cover of the Christmas song "Have Yourself A Merry Little Christmas." In December 2017, Collier announced that the final performance with the One-Man-Show would be held in Rome on 18 December 2017. He discussed plans for a second album, to be recorded in 2018. In July 2018, Collier was one of the surprise guests at Quincy Jones' 85th birthday party celebrations, at the Montreux Jazz Club. On 19 July, Jacob Collier and Friends took place at the BBC Proms in London's Royal Albert Hall. Collier performed alongside Metropole Orkest under conductor Jules Buckley, and invited Take 6, Sam Amidon, Becca Stevens, and Maalem Gnawa musician Hamid El Kasri to be a part of the performance. On 29 October 2018, Collier announced a new four-volume, 40-song musical project, titled Djesse. Following a one-week residency at MIT, Djesse was premiered live in Kresge Auditorium on 8 December 2018. The concert featured his performance with the MIT JC Orchestra (composed of MIT and Berklee College musicians), MIT Festival Jazz Ensemble, MIT Vocal Jazz Ensemble, MIT Concert Choir and Chamber Chorus, Rambax MIT (Senegalese drumming ensemble), Suzie Collier (Jacob's mother), and other special guest musicians from Boston and Los Angeles. Ben Bloomberg, designer of Collier's "Harmonizer" equipment and again a collaborator at MIT, was present in the audience and acknowledged by Collier. The sold-out concert, accompanied by a laser and LED display lightshow spectacular using custom-built lighting apparatus on-stage, was open to the MIT community as well as Boston aficionados. The first single of the project, "With The Love in My Heart", was released on 2 November. Two further singles, "Ocean Wide, Canyon Deep" and "All Night Long", were released in late November. Djesse, Vol. 1 was released in full on 7 December. The volume features collaborations with Voces8, Laura Mvula, Hamid El Kasri, Take 6, and his mother Suzie Collier. The Metropole Orkest featured heavily throughout the album, appearing on every track in addition to Collier's vocals and various instruments. Collier produced, arranged and orchestrated the music himself. In January 2019, Collier began the Djesse World Tour. No longer a one-man-show, Collier is now backed by a band, including the Portuguese multi-instrumentalist Maro, bassist Robin Mullarkey, and drummer Christian Euman. On 8 April 2019, Collier announced that Djesse (Vol. 2) was due to be released on 28 June 2019. The first single from the album, "Make Me Cry", was released four days later, on 12 April 2019. On 26 April 2019, Collier released the second single from Djesse (Vol. 2), a cover of The Beatles' 'Here Comes The Sun' in collaboration with Dodie Clark. 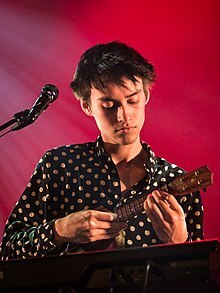 Wikimedia Commons has media related to Jacob Collier. ^ a b Lewis, John (3 July 2015). "Jacob Collier review – jazz's new messiah". The Guardian. Retrieved 27 June 2016. ^ a b c d e "Jacob Collier – the vocalist/multi-instrumentalist YouTube sensation". Jazzwise Magazine. Retrieved 3 June 2016. ^ "SusanCollier.com". Retrieved 3 June 2016. ^ "With 'In My Room,' Jazz Phenom Jacob Collier Is Bringing Jubilation Back". NPR. Retrieved 27 July 2017. ^ Hum, Peter (6 July 2017). ""If you can't paint in primary colours, no one's going to listen to your songs" – The Jacob Collier interview". Ottawa Citizen. Postmedia Network Inc.
^ "Jacob Collier Trio @ the PizzaExpress Jazz Club 31 May 2015". Michael Valentine Studio. Retrieved 27 December 2018. ^ "Jacob Collier- Encore". Retrieved 27 June 2016. ^ "Jacob Collier and Ben Bloomberg turn to DPA Microphones". Retrieved 27 June 2016. ^ a b "Quincy Jones Presents The Future of Music with Jacob Collier and Justin Kauflin at Ronnie Scott's". Retrieved 27 June 2016. ^ a b c d Mason, Amelia. "Reaching Tech's Limit, YouTube Phenom Jacob Collier Seeks A Human Touch". WBUR: The Artery. Boston University. Retrieved 9 April 2019. ^ Lewis, John (3 July 2015). "Jacob Collier review – jazz's new messiah" – via The Guardian. ^ "About- Jacob Collier". Retrieved 27 June 2016. ^ wdr.de (2 June 2015). "I wish". ^ Imort, Carmen Braun / Johannes (2 June 2015). "Jacob Collier - In My Room". ^ "Jacob Collier talks Quincy Jones & Debut Album "In My Room" w/ RobertHerrera3". Retrieved 27 June 2016. ^ NDR. "Musik - Von Jazz über Klassik, bis Weltmusik". www.ndr.de. ^ "Jacob Collier - In My Room - ginalovesjazz.com - the jazz magazine by matthias kirsch". 27 July 2016. ^ "Live Concert - Jacob Collier - 07 July 2016". ^ Jacob Collier (31 October 2017). "#IHarmU LIVE! #1 ft. Lewin Blümel" – via YouTube. ^ "Jacob Collier - JazzRefound 2016". ^ "'In My Room' – Out July 1st!". Retrieved 27 June 2016. ^ Fordham, John (11 February 2016). "Snarky Puppy: Family Dinner Vol Two review – uninhibited, high-flying jazz-fusion". The Guardian. ISSN 0261-3077. Retrieved 27 June 2017. ^ Fordham, John (23 August 2016). "Quincy Jones Prom review – heartfelt tribute to a great musician's extraordinary legacy" – via The Guardian. ^ "Proms 2016: A chance to luxuriate in Quincy Jones's genius – review". ^ "Jacob Collier harmonizes with MIT". ^ MIT Video Productions (8 September 2017). "Imagination Off the Charts: Jacob Collier comes to MIT" – via YouTube. ^ "MIT Video Productions wins third Emmy with "Imagination Off the Charts: Jacob Collier comes to MIT"". 5 June 2018. Retrieved 6 September 2018. ^ Quincy Jones (1 May 2017). "Jacob Collier GRAMMY Speech 2017" – via YouTube. ^ "Jacob Collier Wins Two Grammy Awards – TenEighty – YouTube News, Features, and Interviews". ^ "Grammy Winning Performer Jacob Collier - Interviews - Tavis Smiley - PBS". ^ "Samsung and Jacob Collier Collaborate on New Galaxy Smartphones' 'Over the Horizon'". ^ www.girafficthemes.com, Giraffic Themes. "About - Becca Stevens". ^ "Hans Zimmer's Coachella Diary: "It's Fantastic Shambles" (Guest Column)". ^ "John Lithgow & singer Jacob Collier! - HARRY". ^ HARRY (19 April 2017). "How Jacob Collier Went Viral" – via YouTube. ^ "Jacob Collier - TED Blog". ^ Luzern, Luzerner Zeitung AG 6006. "Die Klangmesse eines Genies". ^ "Jazzfest review: Jacob Collier uplifted fans with his mind-blowing show". 4 July 2017. Retrieved 6 September 2018. ^ Jacob Collier (23 July 2017). "Hideaway - Jacob Collier & Metropole Orkest" – via YouTube. ^ "Prom 7: Jacob Collier and Friends". BBC Music Events. Retrieved 6 September 2018. ^ "Jacob Collier". Arts at MIT. MIT Center for Art, Science & Technology (CAST). Retrieved 9 April 2019. ^ "Jacob Collier at MIT: Djesse Volume 1 Album Release Celebration!". Eventbrite. Retrieved 9 April 2019. ^ a b Webb, Dan (1 December 2018). "Review: Jacob Collier - Djesse Vol. 1". Sungenre. Retrieved 7 December 2018. ^ "Album of the Week: Jacob Collier - Djesse Vol. 1 (2018 LP)". The AU Review. 5 December 2018. Retrieved 7 December 2018. ^ @jacobcollier (13 April 2019). "'Make Me Cry' was released yesterday into the world!" (Tweet) – via Twitter. ^ a b "Jazz FM Award Winners 2016". Retrieved 3 June 2016. ^ "MOBO Awards Best Jazz Act". Retrieved 6 December 2016. ^ "2017 Grammy Awards: Complete list of nominees". Retrieved 6 December 2016. This page was last edited on 25 April 2019, at 17:21 (UTC).